Margaret with the halo tiara. Beautiful! She would cringe, if she knew who else would go on to wear the halo. Imo Sophie should have been given the halo and waity should've worn Sophie's wedding "tiara." But Sophie owns her tiara and Kate doesn't, which makes sense because Kate should get the main jewellery while Sophie will not have access to it in the future. I did not like Sophie's wedding tiara - looked rather hobbled together wonder why sophie did not wear the halo? Sophie's tiara is made up from pieces that already existed. Some people have tried to found out from what pieces it came from and there is a very good theory but I don't remember the details. The only who got her own tiaras was Diana. Sophie two tiaras are bought or created for her and Fergie's was bought. Camilla uses QM's jewels that Charles got on loan from the Queen. Princess Margaret was stunning when she was younger but she did not age well. Some of her jewellery is up for auction. Page ten and eleven in the catalogue and lots 99, 100 and 101. The ruby and diamond ring has an interesting provenance. Just noticed that lot 98 belonged to the Duchess of Windsor. Leaving it to you two - not keen on rubies, although these are a beautiful colour. Prefer all diamonds personally. Used to like sapphires, but have had that Cursed Ring of Doom shoved at us so often I am heartily sick of seeing sapphires. Well, Kate had to give it back right after the ceremony, she wasn't allowed to keep it. The Strathmore Rose Tiara was worn by Queen Elizabeth The Queen Mother. What was the last year in which Elizabeth wore the Strathmore Rose Tiara? It always seems odd to me that that tiara was worn on her "fringe" even though it was the style at the time. But she carries it off and it is very unusual too. Here is Catherine, Duchess of Cambridge wearing the Lovers Knot Tiara. 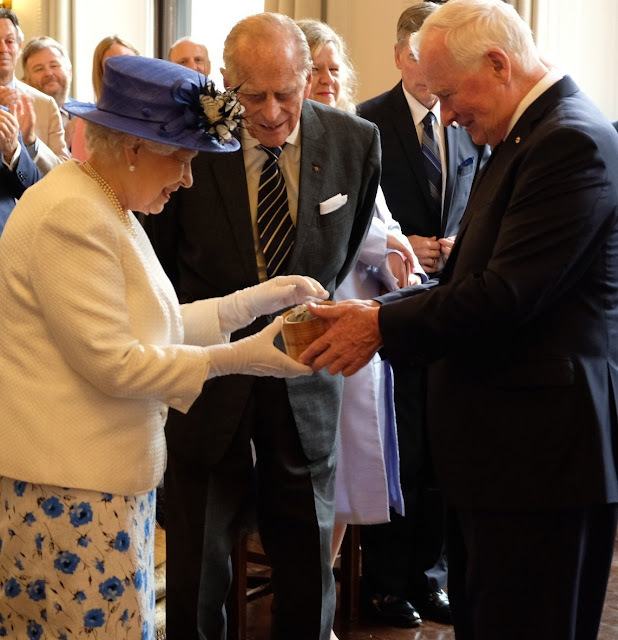 On 19 July, David Johnston, the Governor General of Canada and Representative of Her Majesty The Queen, presented Queen Elizabeth with the Sapphire Jubilee Snowflake Brooch from Canada. The brooch was given in recognition Her Majesty's 65 years on the throne. The sapphires in the brooch came from a deposit discovered on Baffin Island, by brothers Seemeega and Nowdluk Aqpik in 2002. The Beluga sapphires come from Canada's only known deposit of sapphires and have a natural blue color that does not require heat to enhance their colour. 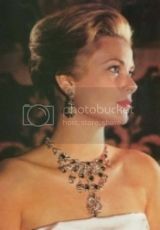 The brooch includes 48 sapphires in varies sizes, shapes, and colors, weighing 10.19 carats in total. The blue stones are arranged with the darkest blue colors at the center, surrounding a diamond dome. The sapphires fade into lighter colors as they approach the edge of the brooch, creating an ombré effect. 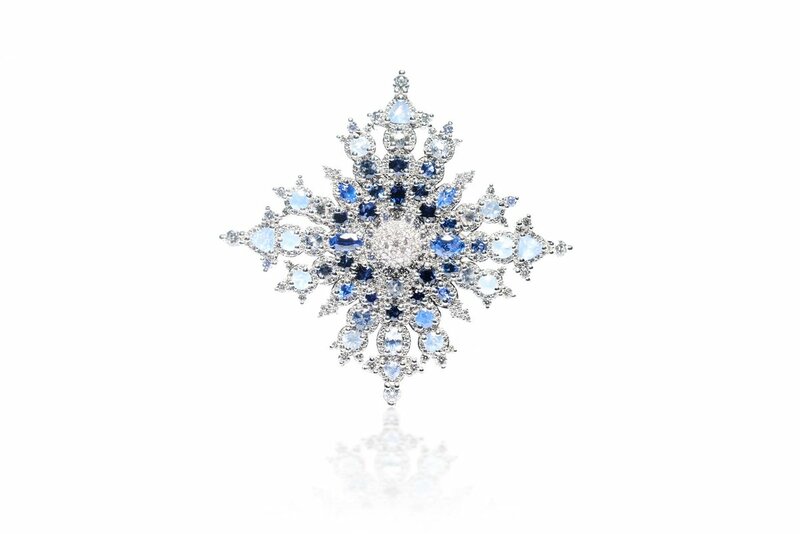 The stones are surrounded by more than 400 diamonds from northern Canada, weighing 4.39 carats in total, and the brooch is set in 18K Canadian white gold. The design was inspired by the Canadian Arctic and is a one-of-a-kind snowflake shaped like the North Star. The brooch was designed and crafted by the Canadian jewelers, Hillberg & Berk. 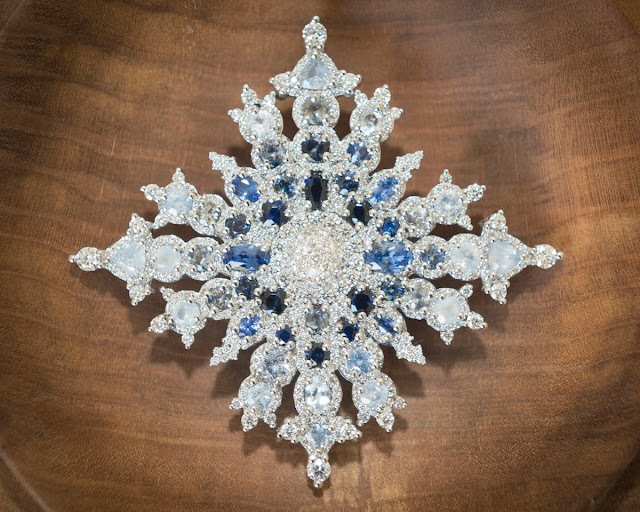 The Sapphire Jubilee Snowflake Brooch measures about 2.5 inches square or 61 mm tall and 66 mm wide. It's gorgeous! I think it belongs here rather than the Liz thread, because jewels officially gifted belong to the crown and not the person, or am I wrong? ^It was informative to learn that the coronet jewels were given to Victoria by her aunt and uncle, Queen Adelaide and King William IV.